Ideal location!! This stunning home is nestled in a private and serene setting, yet is a short walk to The Plaza and just steps from the galleries of Canyon Road. With a clean contemporary look and a southwestern flair, this spacious garden home is perfect for two couples. The warm, relaxing atmosphere is furnished with sophisticated but comfortable leather and elegantly decorated with original art. Enjoy a day of shopping, skiing or gallery hopping in sun-drenched, clear azure blue skies. Entertain outdoors in the expansive private walled courtyard, snuggle up by the charming adobe fireplace, or prepare a meal in the state-of-the-art chef’s kitchen. Put on some mood music on the stereo sound system or channel-surf on the 36-inch television. When it’s time for sleep, slip into your private suite where a comfortable bed awaits and an armoire with additional TV for private viewing. 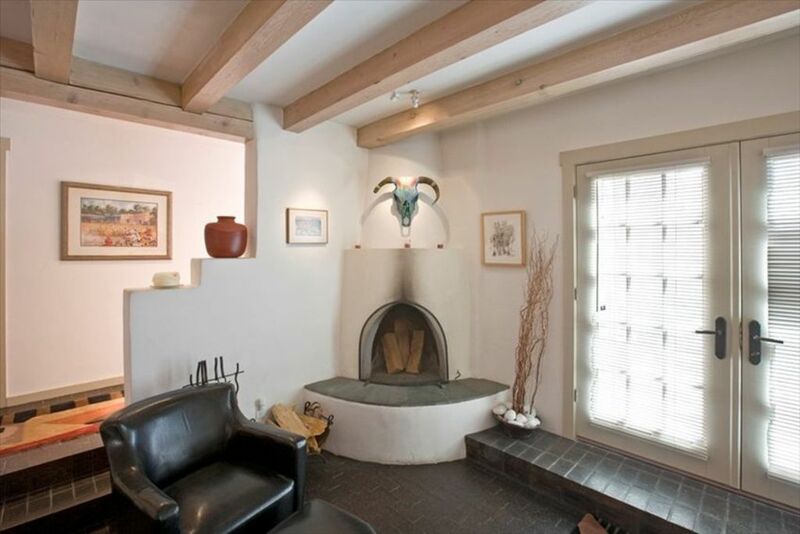 Whatever your pleasure, this elegant adobe is sure to help make lasting memories of your Santa Fe experience! Retreat to this beautiful, one level contemporary, which affords true walking distance to The Plaza and it’s world-class restaurants (less than a half mile) and is just a 4-minute walk to the famous Galleries of Canyon Road. The bedrooms feature facilities for luxurious rest and relaxation, and sleeps four guests comfortably. Tastefully decorated to make you feel even more at home. The convenient location makes not renting a car a viable option, or allows you the opportunity to park your car for the duration of your stay. **Please confirm dates for availability via email. Private bathrooms are in each bedroom. Only an 8 minute walk to Canyon Rd & the downtown Plaza. Plentyful supply of Linens. Property is fully stocked. Plentyful supply of Towels. Property is fully stocked. TV located in Living Room and each Master Suite. Nice location and walking distance to art galleries and downtown. We cooked each night and the kitchen has very nice appliances and utensils. Will definitely stay again if we go back to Santa Fe. Great location, comfortable & beautiful accommodations! The house was quiet, clean comfortable and well appointed. It was a treat to stay there! Great property, cozy with nice ambiance. The property was very nice and convenient to the downtown square area! Great stay. We would love to stay there again upon our next visit to Santa Fe. The home had everything we needed! We even baked a little! Comfortable for two couples. I would stay again in a second. Laura and her husband were very helpful and responsive. Cleaning Fee - $115 Until reservation confirmed, rates are subject to change without notice.